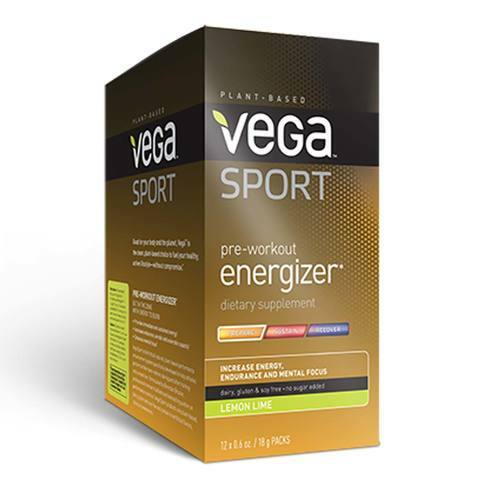 Vega's Sport Pre-Workout Energizer uses green tea and yerba mate for a great workout drink. Warnings: Consult a health care practitioner prior to use if you are are taking prescription medication or if you have a serious medical condition and if you are pregnant or breastfeeding. Notes: Certified vegan. Gluten-free. Non-GMO. Whole food ingredients. Recommended Use: Mix 1 pack of Vega Sport Pre-Workout Energizer in 1 cup (8 oz) of cold water and drink 20 minutes prior to exercise to enhance athletic and mental performance. The customer reviews posted below are based on individual consumer experiences and may NOT necessarily represent what expected results will be from using or taking Vega Sport Pre-Workout Energizer Lemon Lime - 12 - 0.06 oz Packs. These results may not be typical and you should not necessarily expect to receive the same results. Actual results may vary. Since making the switch to Vega Sport Pre-Workout Energizer I have seen an huge improvement in my workouts. I feel myself lasting longer in my workouts and being able to push myself further because I have more energy. The Lemon Lime flavor is fantastic and the easy to use rip and go packaging is super helpful. I just tuck one into my workout bag and go! Super easy to great for me!